Normally, parking a vehicle on an unlevelled ground is no big issue unless you have an RV. This is because RV’s are basically homes-on-wheels that are equipped with appliances such as refrigerators, cookers etc., which should not be operated while tilted. Life can also be very uncomfortable when your house isn’t level. Even if you scout around the campsite for flat grounds to park your RV, some small unevenness is expected. Instead of using wood blocks, rocks or even jacks to do the leveling, there is an easier and more professional way of doing this job in the form of leveling blocks. 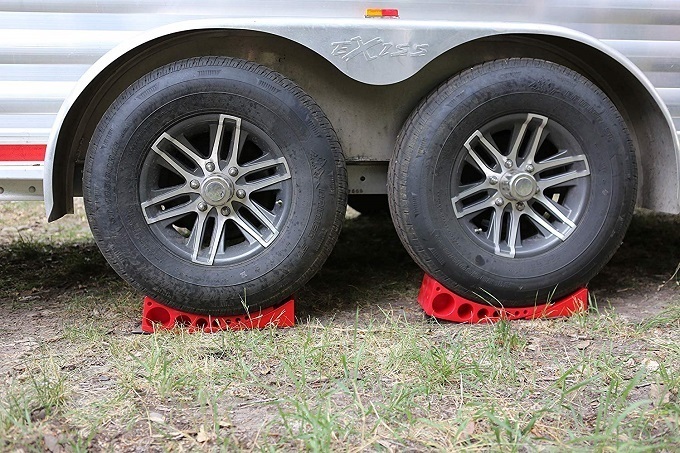 Leveling blocks are specially designed to handle the different weights of RVs and can be easily adjusted to raise the vehicle to different heights. Because of their importance, this article gives you a review of some of the best leveling blocks in the market so that you can have an easier time picking the one that suits your needs. 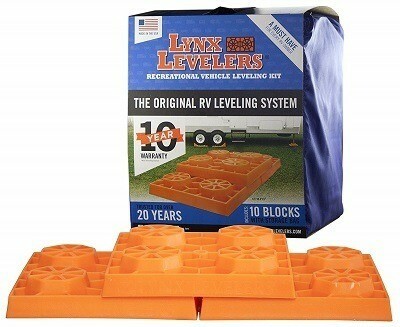 If you are looking for a heavy-duty leveling block that can handle a very weighty RV, then Tri-Lynx’s piece is the best option to consider. This is because it can comfortably carry heavy loads of up to 40,000 pounds, which is way more than an RV would weigh. This is made possible by the block’s strong and durable construction that qualifies it to be used under single or dual wheels, tandem axles, jacks and as a support base for other stabilizing equipment. Despite its strength, the item is very lightweight, coming in at less than 10 pounds when stored in the accompanied nylon storage bag. Another benefit that you get with this product is that it comes as a pack of 10 modular blocks that can be easily interlocked and stacked together to give variable height lifting. They can also be stacked into a pyramid on one end so as to act as a wheel stopper. Camco’s Yellow Drive leveling block is the most affordable product in this review and this can be attributed to the fact that first, it is packaged as a single block and second, it is designed to handle a maximum weight capacity of only 3,500 pounds. However, despite being a single block, the piece is still able to raise your RV to different levels because it has a ramp-like design with 3 steps and a maximum height of 3-7/8 inches on the highest level. For the wheel to ascend easily through the 3 heights, the block has a non-slip surface, which also ensures that the wheel grips firmly once parked. Other features include a lightweight and durable resin material construction and a built-in carrying handle for easy transportation. Though packed as 2 blocks, these pieces are designed exclusively for use with Camco’s leveling blocks so that you can create a modular structure with different height adjustments. However, these leveling blocks must be bought separately so that the 2 pieces in this set become usable. However, once bought, these 2 items with their pyramid shape can be stacked together so as to eliminate dangerous wheel movement by acting as wheel stoppers. They are actually designed for larger wheels and thus, will work perfectly for your RV, trucks, trailers or campers. Plastic is used in their construction, giving them a strong yet lightweight structure that is available in yellow color only. This is similar to the Yellow Drive piece above, which is from the same brand. 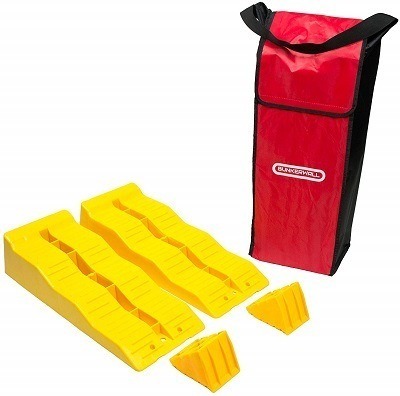 This product is the top-rated RV leveling block in this review because it comes as a set of 8 interlocking pieces that can be stacked in different ways so as to achieve the perfect leveling in your RV. The pieces are also very strong, bearing a heavy-duty design that can carry a maximum weight capacity of 30,000 pounds. Additionally, with each piece measuring roughly 8.3 inches square, once interlocked, they form a step with a wide base that firmly supports the wheel. Despite their strength, the blocks are very lightweight, weighing in at 4.22 pounds. Combined with the included carrying/storage bag, this makes them easily portable. Beech Lane’s camper leveler is quite expensive, but it takes on a different design, having a curved shape that is thin on one side for easy backing up, and thick on the other for raising the RV as the wheel pushes through. This difference in thickness enables you to raise the RV through an increment from 0.5-4 inches, after which you can lock the curved piece into place using the included chock. The set actually comes with 2 leveling blocks and 2 chocks so that you can adjust the height from one or two wheels at a time. Apart from these, rubber mats are also included and they prevent the leveler from sliding out as you back up on it. Other features include a strong nylon polymer construction that can handle a weight capacity of 35,000 pounds and the ability to be cut to size so as to fit between the tires of a dual axle camper. This camper leveler is quite similar to Beech Lane’s product above in terms of design, having a curved shape that is thin on one side and thick on the other. The benefit of this design is that it allows you to adjust the height level or increment on the fly, in which it also gives you an increment between 0.5-4 inches like Beech Lane’s leveler as you back up on the block. 2 levelers and 2 chocks are included in the set, and they have a very sturdy construction that can comfortably carry a weight capacity of 30,000 pounds. However, the tires that go above them must not exceed 32 inches in diameter so that they don’t destroy the blocks by applying pressure on the skinny and thick ends alone. With a ramp-like design, Bunkerwall’s BW4201 lets you back up on it while adjusting the height level of the RV on the fly, and after hitting the right spot, interlocking chock blocks are included for locking the wheel in position on the ramp. The product actually comes as a set containing 2 leveling ramps and 2 chocks, with each ramp having 3 steps that can raise your RV up to a height of 3.8 inches. All the pieces are made of a high-density polyethylene material that can bear a maximum of 8,000 pounds of weight per axle. After use, a strong nylon carry bag is included for packing away the blocks and chocks, preventing them from ruining your RV’s interior with dust or mud. Each leveling block is designed to handle a certain weight capacity. This is important to consider because if your RV is heavy, then you need a leveler that can handle this weight plus the appliances and components that are inside. In such occasions, there are some heavy-duty units that can comfortably carry as much as 30,000 pounds while others go a step further to 40,000. Generally, these heavy-duty blocks are the best because even if you upgrade to a heavier RV later on, they will still be useable. However, you can also get the lower weight-capacity rated leveler if you are on a tight budget but you must ensure that you do not exceed its limits. Another important factor to consider is the size and shape of the leveler. On size, you have to check how high the unit can be used to raise your RV. Measured in inches, the higher the rise, the better because this will give you a wider height increment to use so as to make your vehicle level. When it comes to shape, there are ramp-like blocks with steps, curved levelers and modular interlocking blocks. Ramp-like blocks: they have a strong solid body but their height is fixed and can be a bit challenging to use in between the 2 wheels of a tandem axle camper. They also tend to be slippery as you drive on them, although some take care of this using non-slip surfaces. Curved levelers: these also have a fixed height but they can be cut so as to fit in between the wheels of a dual axle RV. Interlocking blocks: are the best type because they are strong and can be easily interlocked to create any shape or height that is suitable for balancing your vehicle. Most of these products are made of different types of plastic, with some types such as nylon polymer being stronger and consequently, build tougher blocks that can handle more weight as compared to polyethylene plastic. As a general rule of thumb, the tougher the material, the better. Durability is also key because so many things can go wrong if the block breaks while in use. Your food may spill, you might get injured, some of your appliances may get destroyed etc. This factor is especially important to consider if you intend to travel to areas with extreme climatic conditions such as extreme heat or extreme cold because high temperatures make plastic soft while low temperatures make it brittle. The block must be able to withstand all these. Generally, apart from the manufacturer details, other selling points that might show you whether a product is durable is information from actual users as well as the warranty coverage. A manufacturer can only back his/her product with good warranty terms if he/she is confident and sure that the product will perform. Therefore, if the terms of the warranty are good, then the leveling block is most likely highly durable. Because camping outdoors should be all fun and little work, setting up the block and leveling your vehicle should an easy task that takes as little time as possible. For this reason, check whether you can set up the unit and drive on it on your own and whether it is also easy to clean before packing after use. Even though DIY RV leveling blocks or even the regular wooden blocks might work, they are certainly not as safe as their professionally made counterparts, which include the ones listed above. After going through this RV leveling block review, it is our hope that you will be in a better position to pick the best RV leveling block that is suitable for your you and your camper.